I live in a rural area that is always a season or two behind on the latest fashions. 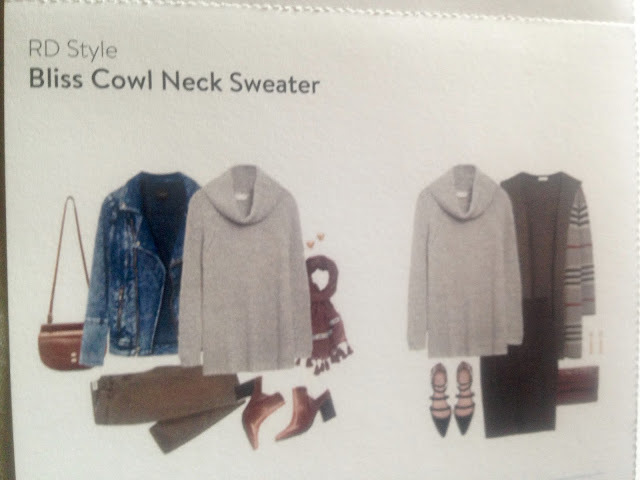 Because of this, I subscribe to Stitch Fix boxes seasonally hoping to get more on-trend items. I usually schedule a Fix four times a year; one for every season. My last Fix however, although a good one, was suppose to be a Summer Fix, but I felt the clothes I received were more appropriate for Fall than Summer. I kept three of the five items in the Fix and then decided to cancel my Fall Fix since I had received my fall clothes in this Fix. 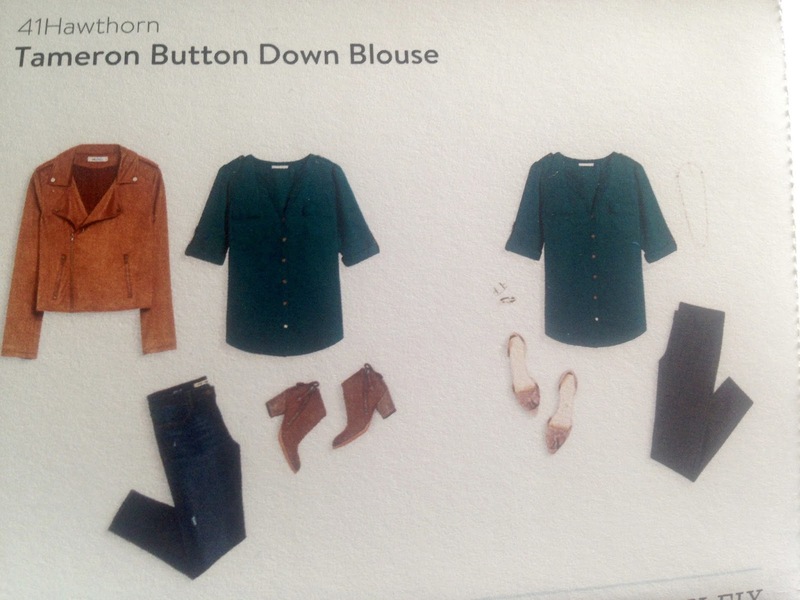 Well, Stitch Fix must have noticed I cancelled my Fix because they sent me an email asking me to give them another try and they would waive the $20.00 styling fee. I thought, "Why Not? What do I have to lose?" So here is my review of my latest Fix. Three of the items I received in my Fix I'm wearing above. The skirt, sweater, and bracelet. 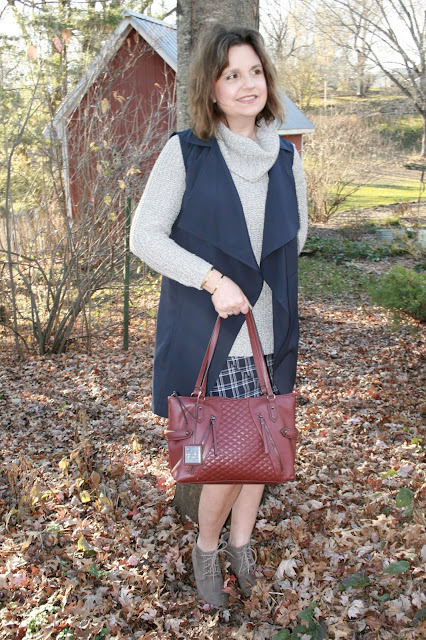 The vest I received in my Summer Fix HERE. I styled the items this way because my stylist suggested it. 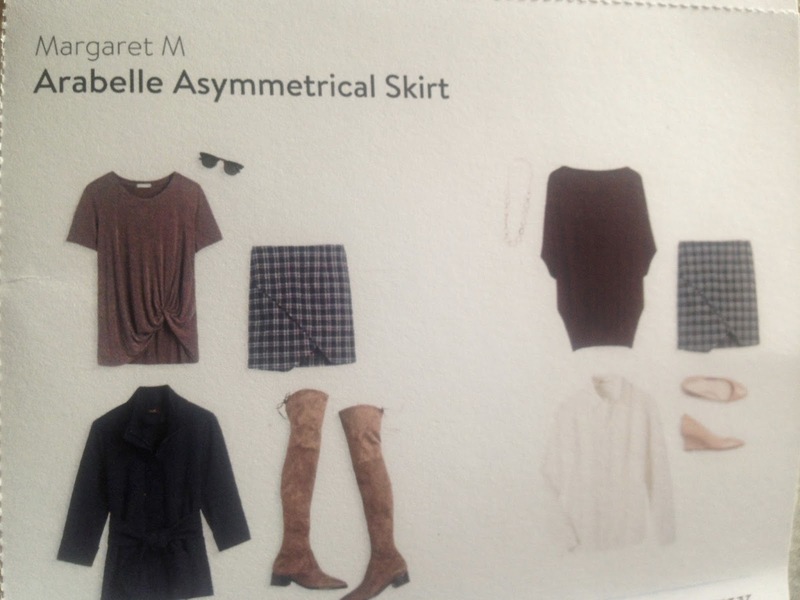 She wrote in her note to me "For a fall chic look, pair this with the grey RD Style Sweater, and complete this look by layering on the Pixley trench vest from your previous Fix, along with brown or grey booties." I thought this was an excellent suggestion. I really liked the way the vest looked with this sweater and skirt; which is so funny considering in my last post HERE I was struggling with how to style this vest. The cost of this skirt is $74.00. For your sizing reference, I'm wearing a size small. In fact, for those who may want to request any of these items in your next Fix, everything I received was a size small. Here is the styling card. I think this skirt is super cute. I love the asymmetrical cut, the pattern, and the short length. Any regular reader of my blog knows this 50+ woman has no issues showing her legs! However, I already own two very similar short skirts: one chevron skirt I bought from JCP HERE, and a plaid short skirt sent to me in a previous Fix HERE. I simply did not need another short, dark patterned skirt, even though it has the unique asymmetrical hemline. Now my next item, the RD Style Bliss Cowl Neck Sweater is a very nice sweater. I like the length. I like the color. My problem with it is that it's a heavy knit which I don't like because it adds unwanted pounds to my frame. I also think it's too warm. Although I live in Northern Wisconsin and experience below zero temperatures many times during the winter, this sweater would be too warm to wear indoors and too hot and bulky to wear under a winter coat outdoors. I think it would work best on a cold day in mild climates without a jacket to be honest. But that's still not why I'm sending it back. I just don't think its anything special. I could find a very similar sweater at JCPenney or Target for $20 or $30 (less if I use a coupon! ), so why would I want to spend $78.00 on this one? As I said in my first paragraph of this post, I subscribe to Stitch Fix so that I can receive trendy items; items I can't find locally. I can find this sweater anywhere for a fraction of the price. I received one piece of jewelry in this Fix. 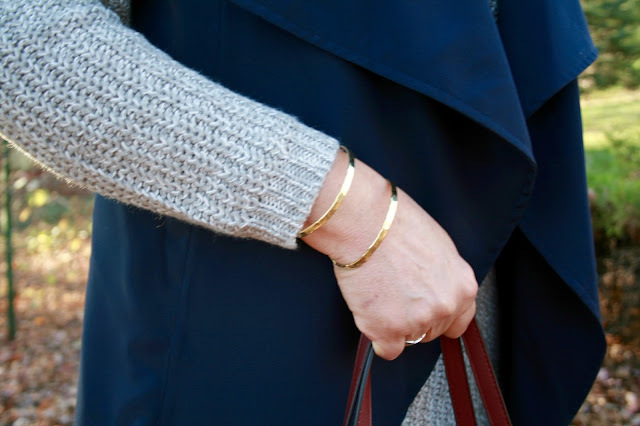 This gold, Zad River Hammered Cuff. I like it, but it costs $28.00. I'm not sure that it is worth it. I could probably find something similar for $5.00 to $10.00 somewhere else. But, my husband liked it, so I'm thinking about it. My Fix arrived on a Saturday and I have three business days to decide what I want to keep or send back. So I'm still thinking about it, and you can help me decide in the comments box below! 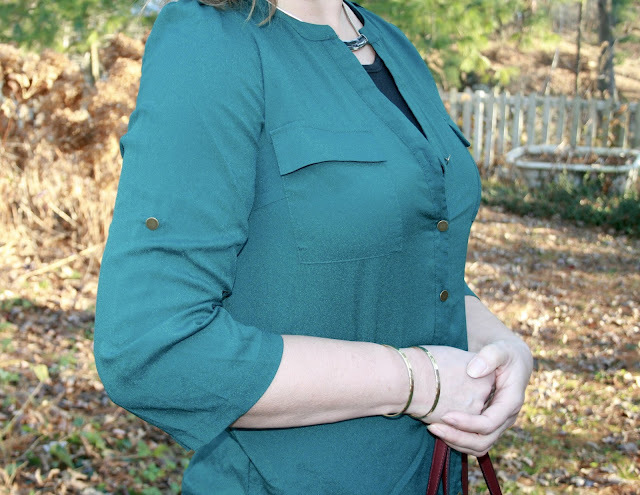 My next item is a teal green button down blouse. Here is the styling card. This is a very nice blouse, however I knew before I tried it on that it was going back. I already have a green tunic that I received from a previous Fix (see THIS POST), plus a teal cardigan shown in these posts HERE and HERE. I did not need another green shirt. Also, button downs do not work for me because of my large bust in comparison to my frame. The shirt fit perfectly except in the bust, so I had to wear a tank underneath just to photograph it. I had the "button gap" syndrome! I took the suggestion off the Style Card and wore my top with dark jeans and leopard print flats. If you like button downs (they are not my favorite), you will like this shirt and might consider requesting it in your next Fix. The fabric is very soft and comfortable. It has a lot of nice detail with the gold hardware, the pockets, the rounded hemline, and the interesting pleated sleeve caps. The cost of this shirt is $58.00. And finally, here is the one I need your help on. This is the only item in my Fix which I am torn whether or not to keep. The Tart Patmos Bomber Jacket. My husband absolutely loved this jacket and I really like it too. I've been wanting a bomber jacket FOREVER, but just can't seem to find the perfect one for me. Out of everything in this Fix, this one was my favorite. And I really appreciate that it is a trendy item. However, there are a couple of things I don't like about it. The first one being the price. It costs $88.00. That just seems way too steep. I only spent $134.00 on a down winter coat from Macy's last year. $88.00 for a jacket I won't get much use out of seems frivolous. Secondly, I'm not sold on the jacket's material. It is a knit material, and although that makes it very comfortable, it just doesn't seem like a jacket to me but more of a sweatshirt. It's very clingy in the arms, so I would be limited with what I could wear underneath. The styling cards show button downs or tunics with it, but I think those type of shirts would be too bulky underneath. So I styled mine with a form fitting Covered Perfectly long sleeve tee underneath. I like the black and white pattern on this jacket. 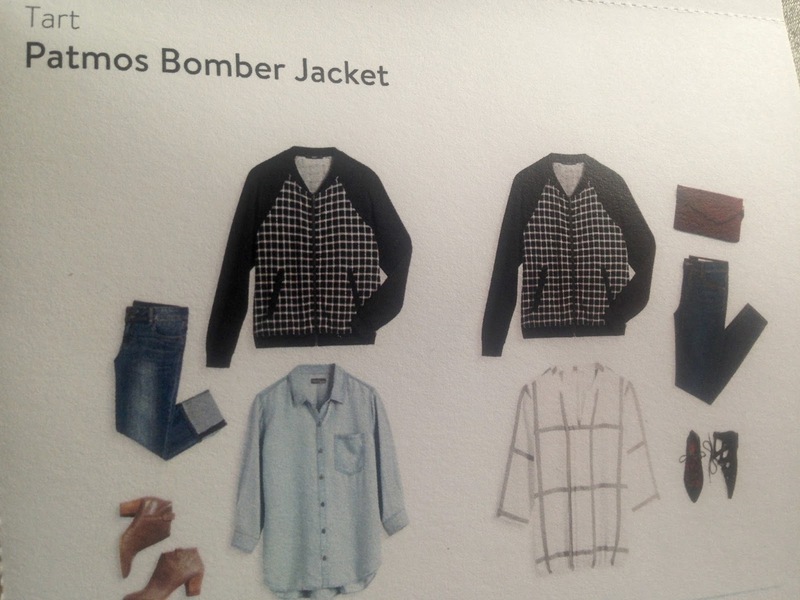 I also like that it seems to be a more grown-up version of the traditional bomber jacket. I wore my bomber jacket with old Express jeans and I accessorized with a new rhinestone choker I picked up on our trip to Galena. I have until Wednesday to decide. I would love to hear your thoughts if I should keep the bracelet, jacket, or both. Or do should I just send everything back since I don't have to pay the styling fee. Please let me know in the comment box below. Edited to Add: I returned everything in this Fix. If my styling fee had not been waived, I would have kept the bracelet otherwise I would have had to pay $20.00 for nothing. I decided to return the jacket because of the material. If the material were more coat-like and less sweatshirt-like, I would have kept it. I think that's one of the reasons I haven't used Stitch Fix either---the prices are pretty steep. Especially for us thrifty girls! The bomber is fun and trendy but I do think you could get a less expensive one from Shein or Zaful online?? Not that I'm opposed to paying good money for a good product, but I'm not sure you'd wear it forever?? The bracelet however, I might keep! Sure it's almost $30, but it's one of those pieces, I bet you'd wear over and over for many, many years! And sometimes convenience has a price! Besides, I'd feel like then at least I wouldn't have to pay for the styling fee. Yes Jodie, I am a thrifty girl, but I am willing to spend more if I feel it's a unique, one of a kind piece that I think I will get a lot of wear out of. I just didn't receive any of those items in this Fix. I am leaning at the moment to keeping the bracelet. The styling fee was waived so I don't have to worry about it. Well at least you like your bracelet and skirt! I agree if it costs too much or is not worth it send it back! Looks like a great Stitch Fix box. I would keep the bomber jacket as they seem to be on trend and you could wear it through pretty much most seasons. I just received my first box last week and I was pretty happy with it. I kept 2 of the 5 items and I'd probably order another box in a few months. Thanks I agree. It was a great box, I just already owned a few of the items. 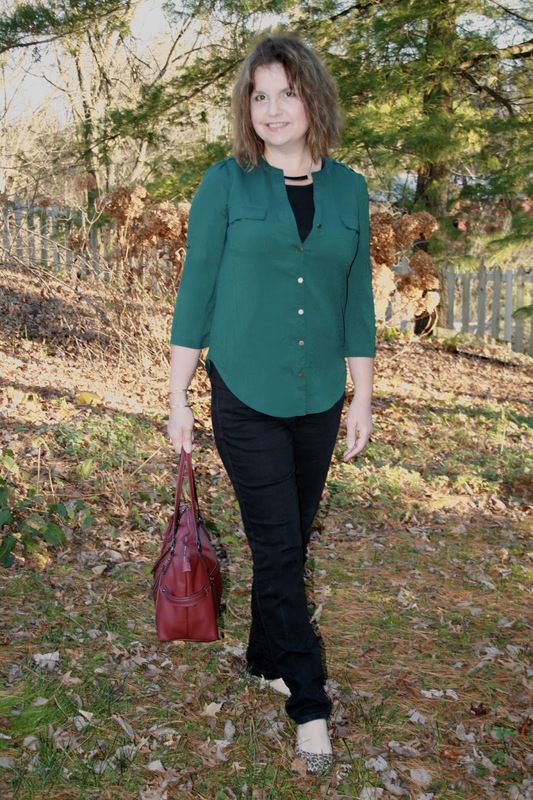 I always love reading StitchFix posts! I love the long vest with the sweater & skirt. 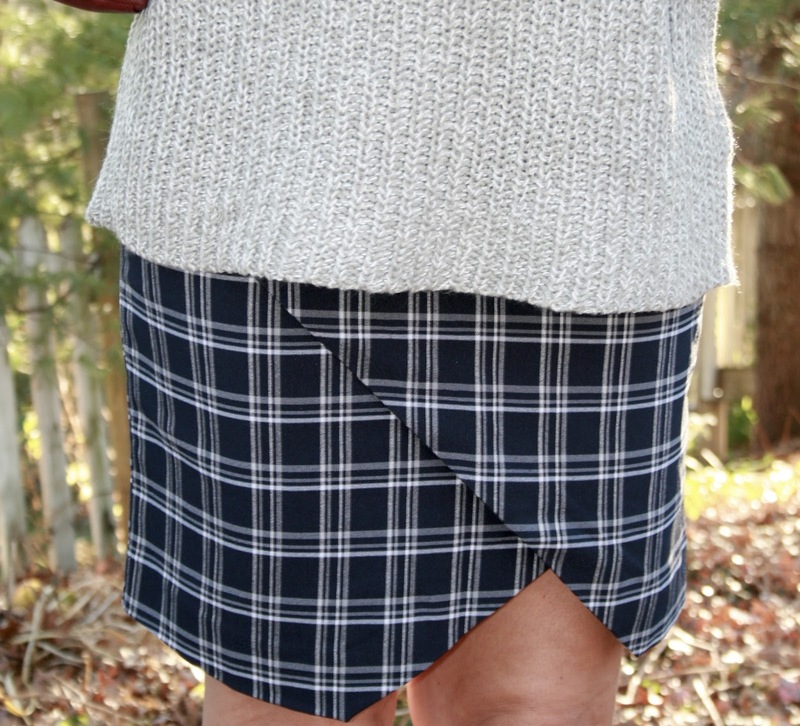 Since you have similar skirts, maybe you can recreate that look with one of your own skirts and a more affordable sweater? Thanks Andrea. I will definitely be recreating the look with items in my own closet. I like the bomber jacket too, I just feel it's too expensive for basically a sweatshirt jacket. If it was canvas or nylon it might be a different story. That sweater is adorable but I understand why you are sending it back. I agree, the sweater you can get anywhere as well as the bracelet. But that bomber jacket! It's so cute and I love the pattern. I would splurge and keep it! Thanks Jill! I love the bomber jacket, but it's just so expensive! The bomber jacket is really cute, however it is trendy. I tend to spend money on classic items that transcend a season or two. The bomber jacket could be out of style next year. That being said if you wear it all the time for Fall and Winter then get it! You got some great items! I agree with the steep prices though. That bomber jacket is my fav! Thanks Laura! I so agree! 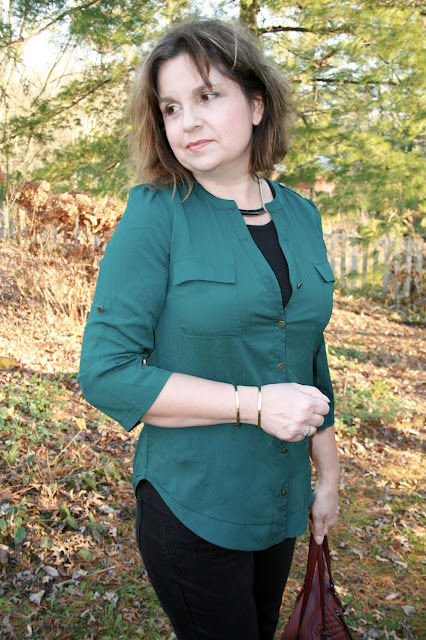 Loving the stitch fix haul! That plaid skirt is the cutest! Great outfit. I love that skirt & jacket!